We love using essential oil foaming hand soap, but we do not love buying it or the refills. Because… the price! So I figured out how to make our own. Obviously, benefit #1 is that you'll save money over buying it. The essential oil foaming hand soap refills are pricey! 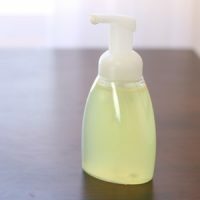 However, you'll not only save money over buying the refill soap mixture for your dispensers, but foaming hand soap in general is a great alternative to bars or pumps of straight soap. This is because you use a tiny bit of soap in a foaming hand soap dispenser (it's mostly water inside) and this allows your liquid soap to go way, way, way, way further. Like 20x further, if I was to guess! Next, the children can get involved. Such a simple recipe and a great task for them to do! We have 3 of these — one at each sink — and refill them all at the same time. Finally, your soap can be truly good for you. Use a good base soap (I use Dr. Bronner's) and essential oils with anti-bacterial and cleansing properties. I use this immune boosting essential oil blend. No worries about toxicity, and you can adjust to suit. Need a dispenser? Well, you can buy them here — or you can repurpose a cheap one. If you don't have one already, you could buy a cheapo just to empty it out and fill it with good stuff. Not that I'm encouraging waste, mind you! We love using essential oil infused foaming hand soap, but we do not love the price on the refills. 😉 So I figured out how to make our own refills. Use whatever essential oil you prefer; I'm using this immune boosting blend. This is a great task to get the children involved in, plus you can stretch your soap A LOT farther because you need so little soap in a refill -- it's mostly water! Pour water to fill within 1" of the top of the dispenser. You need enough room for the other ingredients and to put the pump lid back on. Add liquid soap, oil, and essential oils. Dispense soap as needed. Use and enjoy! 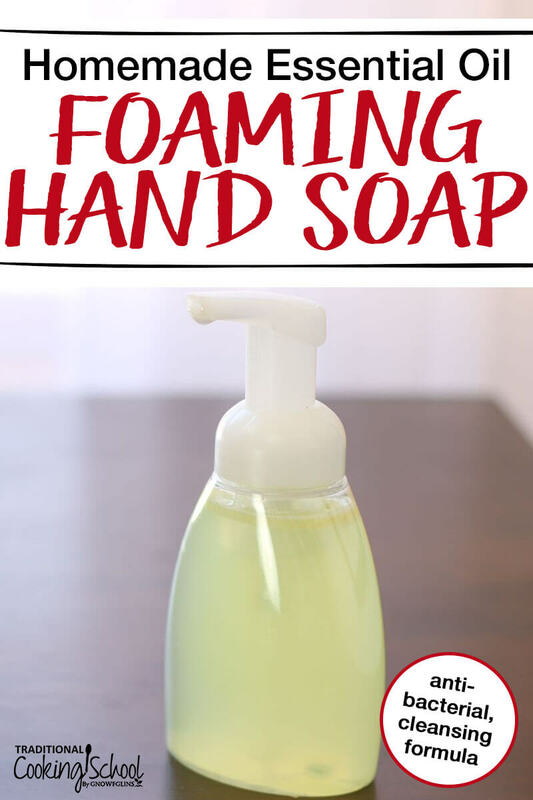 Do you make your own foaming hand soap refills? What are your favorite essential oils to add? I did this for awhile, but my pumps seemed to break a lot… Maybe I’ll try it again. Can you tell me why add the oil? Also, a tip to share: add a handful of decorative glass beads/ rocks (like from craft store) to the bottom of the bottle to weigh it down and to help mix ingredients when shaken! I was wondering about the oil, too. I’ve been making my own but I’ve never heard of adding that. Thanks for clarifying. I’ll start adding a bit of oil. Try sweet orange and peppermint in equal amounts. It’s lovely. What soap did you use? Did you vary the recipe at all? It does usually foam very well. We’re not sure on the size of the pump, but 8 ounces sounds close. My only problem with this is that you have to shake it before each use. That is a little hard with my young grand babies…any suggestions? Love your recipe! Now I can make my own foaming hand soaps. 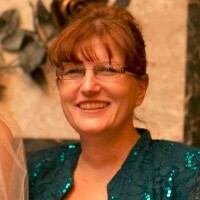 Wardee, you do such a great service on so many levels. Can you use rosemary essential oil? The only reason not to use rosemary oil would be if someone in your household has MS (muscular sclerosis). Rosemary oil can trigger a relapse in this condition . We are not in a position to give medical advice but we cannot find any research to corroborate a link between rosemary essential oil and MS.
Hi wardee, Thank you for sharing this recipe with us. I too had a hard time with the price of replacing foaming soap. I had Bronners castile soap with eucalyptus on hand, added a few complimentary drops of basil essential oil, olive oil and water and what a pleasant fragrance, nice foaming soap that feels silky smooth to my hands and skin. Adding olive oil made all the difference. Enjoying what I’m learning thru you and your school. I’ve been using a similar recipe for a while now. I love it! However, I’ve noticed that my sinks are starting to drain slowly. I’m wondering if it’s build up from the oil. (We use coconut.) Anyone else have any issues with this? Wardee hasn’t had an issue — not any more than with using more natural soaps in general. She does regularly use baking soda/vinegar to clean drains, though. Hi, would washing dishes with this soap be a good idea??? We don’t think so. It is too diluted and also not a great soap for washing dishes (it doesn’t cut grease like a dish soap). Sorry! Does the end result leave a dry soap feeling? I have tried similar recipes – not using foaming dispenser – and not matter which our how much oil I added, I’d still get that dry soapy feeling that you get with pretty much any soap. (I’ve never tried Dr. Bronners due to price, but make my own liquid soap by adding shaved bars of Kirks Castile soap to hot water). Dr Bronners is worth it if you dilute it. A lot of stores carry the small travel size for a cheaper price so you could still get a good amount of use for your money. Is it a dry soapy feeling or are you new to natural soaps? I only ask because that dry sticky feeling is what normally gets people at first, especially after a shower. It’s actual clean skin, not coated with a chemically based “moisturizer” like you find in your dove or other bath products. If that’s not the case then maybe the boil down method is the problem? I haven’t had much success with that method myself. That’s right. It’s a dry, tight feeling. I am not new to natural soaps, though. I feel that all the natural soaps I purchase leave this feeling, but I don’t know why. I guess I know now. Thanks. By the way, I was looking at Dr. Bronners on Amazon just a few days ago. As I read the ingredients, I noticed that there is no soap in it! Just a bunch of oils and two ingredients that i did not recognize, but I don’t believe that they are soaps. The ingredients in Dr Bronner’s soap are soap ingredients. Look again, you’ll notice potassium hydroxide, also known as potash. This is what saponifies the oils, or turns them into soap. Don’t worry, it’s the real deal. This isn’t something that Wardee experiences. This is perhaps related to water hardness or softness? We can’t suggest anything, sorry. I have not tried this soap recipe but I had the same thing happen to my bathroom granite. I noticed that there moisture under my soap dispenser and it had discolored the granite. I dried the spot off and left it for a few days. The spot finally started to lighten up. I now keep a glass coaster under my soap dispensers to keep this from happening again. You didn’t mention what size container you are using or how many ounces of water you are using. I have seen recipes that use 2 to 1; some use 4 to 1 (4 parts water to 1 part castile soap). I would find it useful to know how many ounces of water you are putting into the container so I can determine the ratio. For instance if you are using 7 ounces of water and 2 Tablespoons of Castile Soap (1 ounce). That says the total mix is 8 ounces which means the ratio is 7 to 1. But if the ounces of water is more than 7 then the ratio needs to be revised. If I have a container that has 32 ounces of water, I know I would have to use more than 2 Tablespoons, otherwise the mix is going to be to weak. You are using a vague measurement of 1 inch from the top, and then use 2 Tablespoons of castile soap. 2 Tablespoons is an exact measurement as it is based on the ounce size of your specific container. So it is better to know how many ounces the container holds, how many ounces of water to use because we know we use 2 Tablespoons of castile soap. Once I know the specific ounce of water (and the size of the container), I can adjust everything according to what size I am making. So I need to know what size dispenser you are using and how many ounces of water you are using. Are you able to get that information? The comments I read are all favorable. It sounds like a good one, I just need the missing information I listed above. You can easily scale this recipe up by multiplying all of the other ingredients by 4 and then adding enough water to fill your container. I usually add about 1 teasp vegetable glycerin to my foamer recipe for app 6 oz formula, instead of olive or coconut oils. Is there any reason not to do this? I’m late to this post, but I just had to chime in to show my appreciation for the share. I do make the foaming soap with Castile. I don’t know why it never occurred to me to add essential oils. Boy do I feel silly! So, thanks for sharing! I will add that making this with the sweet almond Castile soap smells like Jergens. That takes me back to some fond childhood memories of being forced to wash my hands before meals. LOL!